It was always my intention to release my latest fiction offering before the end of 2013, and though the first ambitious self-set dates for this passed by, this aim is now all but achieved. The second in the Savage Short Loves series is currently in production (at what once would have been the printer’s, but what now manifests itself as the inner workings of KDP). 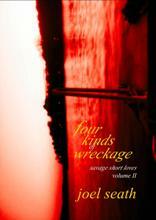 Four Kinds of Wreckage (Savage Short Loves: Volume II) is almost ready, so this post serves to draw attention to this. Details of how to access the book will be made available once (all being well) the digital fruits of my love are blessed at KDP. The other purpose of this post is to take stock of the writing year. Recent posts have shown the difficulties for my family in the past few weeks, but words are never far away. It was always my intention to dedicate this latest book to my father, ever since we came to realise the scale of the failing of his health. It is apt then that the processes of writing, reviewing, editing, production have come together at this time. Is there ever a year in which a writer writes all that he or she sets out to? That said, the first two Savage Short Loves books have been released in 2013, and that is reason to be pleased. The final volume in the series should have a more realistic target publication date. To that end, I tell myself: no later than the end of 2014. When we write, if we write for the possibility of publication, we must also write for ourselves. So I count these private writings as achievements too. Though there have not been as many as of previous years (for a variety of reasons), there have been some to keep me ticking over. Some are scribbled in notebooks, some straight to the screen; some are scraps or lines of poetry; some are the daily notes that grease and crease the creativity. We need our private words as much as we need our public words to be read. Then there are the ghost formations of works that will be written, but not this year. These are the novellas and novels that sit and wait. Even words that have yet to be written, if formed in abstract shapes, if felt, left to stew, are our writerly achievements; though if they reach this stage and then fail to manifest, we may think in some way otherwise. Included here in possibilities are the various collaborations that have been mooted to me. Of these there are two exciting ideas in the offing: one, the possibility of writing loved/seen arrangements of beauty and subtlety (this is the way I think it at this stage); the other, more of a formation of a journal of depth and delicacy. Maybe neither will happen, but they both exist in the present in the liminal space of ‘maybe’. In the scholarly field, there have been invites for collaborative writing and working. It is to this aspect of my writing practice that I also intend to focus more attention in 2014. It’s high time that I set about more papers to compliment and advance my thinking and writing (such as the ‘other’ blog) in the field of children’s play. There has already been much written here, and there continues to be plenty of scope for more. I’m fortunate to have contact with a circle of respected writer/peers in this field, and their honest appraisal of this writing will be invaluable. In the world of fiction in 2013, I’ve also been blessed in having the support of people like Kirsty Fox at her Bees Make Honey Co-operative. Kirsty’s taken on some of my books for sale and, by the looks of things, is making great strides in promotion of independent artists of various flavours. I’m keen to get a local designer to create the cover of a future book (he said he would, and I’ll hold him to it). Sometimes local, crafted, loved, shines through. Online in 2013, amongst many, I would like to pay special thanks to the continued writerly support of people such as Sonam C. Gyamtsho (who is editor, reviewer, nagger, friend in a far land, all of these), Ty Roper, Exiled Prospero, and Val Cameron. So, onwards and onwards. Words are love. Keep writing. The fog hangs damp on this early December morning as we prepare to accompany my father’s final journey. The hearse is already here and I’m not ready: shoes, suit jacket, card for the flowers. I’m not sure we’re ever ready. Outside, as the black-suited driver and his fellow pall-bearer wait patiently, car door open, I pause on the pavement just to see: here is my father’s coffin; they’re arranging flowers and cards inside. There’s a heavy element of the unreal about all this: all those times and now this time. We’re quiet in our various private thoughts as we slowly drive along the local roads. Then there are tears and realisations. Along the way, cars slow or stop on the opposite side of the road as we pass. Soon we’re heading north out of town. The fields are frosted over still, despite the lateness of the morning. The sun is a hazy possibility struggling behind the thickness of the cotton wool day: greyed over us. Slow motion folds over me as we enter the long, winding driveway to the crematorium. Here is the garden of remembrance, a pond for meditation, stones and flowers and ribbons on tiny trees. Where is everyone we know? The suited woman alights from the hearse in front and walks ahead. This symbolism of our modernity enwraps me. Slowly, slowly the rest of the family members and friends, those we know, trickle from the room where they’ve been waiting. Here we are. The slow flow takes me. I take one of my mother’s hands and we walk behind my father’s raised coffin. I have been to funerals before but some particular ceremonies are impossible to fully assimilate: in the moment, after in the writing, and on. Is it this symbolic and ceremonial to define us, above even language? There are some beautiful words said, but there are beautiful words also felt, and beautiful sadness, without language itself, infusing this. Dad catches us out, unawares, with words he asked Mum to promise she’d let us know. I will always hold these, just as I hope he heard my words to him, in that hospital room, and took them with him, some nights later, that night which already seems misplaced from reality. There is a gap in the calendar: it will be the yearly unreal in which to fall. Words and symbolism and the felt-though-unspoken are breathless depths. When the curtain closes on my father’s coffin, despite assurances that it’ll remain intact whilst we’re all there in the chapel, I’m not ready. Maybe I’ll be ready, one day, when I least expect it. After the quiet condolences of friends and family in the courtyard, and as we drive away, the fog lifts: the sun bleeds out over the white-frosted early afternoon fields, this early December day of continuing innocent unreadiness. Where is there to go after loss? I always knew that words might, somehow, come for me. There has been such tremendous loss, such as we have never truly known: my father’s passing has left us, variously, heavy of spirit, dull of comprehension, yet relieved that all that he feared has now slipped thankfully away. Words fell away from me during days in which nothing was real, in which there was the surreal yellowness hung upon the world. Still we inhabit a gap where, for one at least, every so often when I think of him, quietly, I’m not sure where I am. Time has always been a theme. Now this is compounded further. I always knew I would write in sad surreal times such as these: when they finally came. Yet, I didn’t know how words would slow to a trickle, condense to truths and memories, rarefied and as yet unformed. Words did not fully go: they flew in shapes and far above, in ways I had no ways of firmly catching. We sat for hours with him: we said love and we cried. We waited because he wasn’t ready. There were times when there were just wordlessnesses. Time folds in myriad ways. So, in my vigil, our vigil, his fighting, written words were rare, as in pure, like oxygen. What unfolds beneath, in such time-focused days, though? When I opened my notebook to the possibility of memories, one day, travelling north when all those around me didn’t know such delicate trauma sat amongst them, when nothing else mattered to me, the sketches of my past tumbled end over end. These were the start of words. This I knew. Perhaps we should take great care with words in such rice-paper days as these. The temptation is to grieve with great abandon, with the melodrama of unique experience. What we feel here and now, what I feel here and now, some days on, some days deeper in, is what half the world has felt, will feel, some day. The other half will be the grieved for. How the world can cope in such continuous flux, I wonder at. Yet we have the love of one another, the empathy of strangers, the company of words. This is just beyond the start of words. My father once said, ‘Son, work with your brain not with your hands.’ This I repeat again and again, in written words and thought. It is a mantra for now. Though I need my fingers for words, I don’t build (except the construction of thought); though I pause with the press of my palms, I find them soft because I write. I find me soft because I write. There is a certain malleability to this point just beyond the start of words. Anything can be, if the words can be welcomed in. So, after loss, where there is to go is further in. This is not a state of despair or an inability to move; this is a state of grace, of love unappreciated, of time. It may be time I have no understanding of, like the particular yellowness of the moon, one night, or like some metallic light beneath the imminence of a storm, but it is time nonetheless. It is a moment stretched in which the themes to have endured are folding over on one another: time, love, beauty, sadness. Words can help. This I have always known.